secretlondon visited one lunchtime in September 2008. She had one of the daily specials - a chicken kebab with rice and salad (£4.80) photo and a coffee (90p) photo. 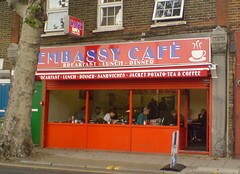 They also do all-day breakfasts photo, sandwiches and jacket potatoes. They do some vegetarian set breakfasts. The toilet was through the kitchen area and Heart FM radio was playing. I believe this cafe does the best coffee of the three on Grange Road (the others being Tas-Ty Snacks and Best of Bermondsey), as the other two sell instant. Accessibility: One step to get in. Toilet would be tight to get to but wouldn't involve any extra steps. Last edited 2008-12-13 17:07:34 (version 11; diff). List all versions. Page last edited 2008-12-13 17:07:34 (version 11).